Make a difference in your community while becoming a member of a respected team. Contact us today for all your regional or dedicated dry-van freight requirements. Commercial trailer rentals are the perfect solution for all your storage needs. If you have needs including dedicated or contract freight deliveries, same-day or next-day expedite service, or storage rentals; R.G. 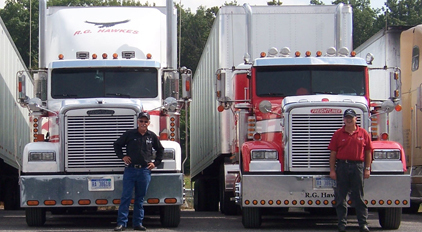 Hawkes Trucking is your solution. 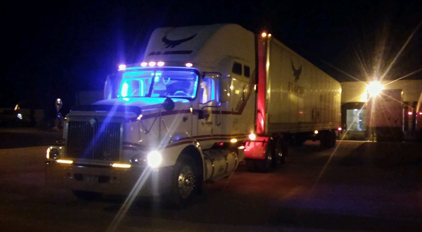 Take advantage of the peace of mind and lower cost base benefits we provide as a 100% asset based carrier. Deal directly with us - time-proven professionals capable of handling your freight and storage needs with incomparable service. 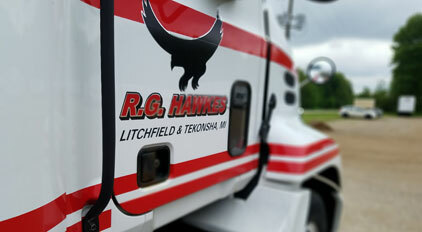 With more than 40 years’ experience as a local family and veteran-owned and operated company servicing the states of Michigan, Indiana and Ohio we provide the dedication and commitment to service you've been looking for. Whether you are expanding your facility, relocating to a new warehouse, preparing for a bank build, conducting annual inventory or simply don't have enough space for all your machinery or other production materials - we have the answer! Get more floor space and clear your docks of excess returns today by renting from us. Permanent or temporary storage trailers on your property provide the most flexible option on the market today. Unlike traditional storage containers; your "warehouse on wheels" can be moved to any location required, whenever required. This flexibility not only saves you time and money, but is simply the common sense solution to all your storage woes.